My one and only daughter, Rebecca is getting married and we have been looking at wedding gowns. She tried a few on a couple of weekends ago in this little exclusive shop called POSH. We walked in and were greeted by the owner and designer and asked if we would like coffee, tea, soda or a mimosa. I opted for coffee which was brought to me on a tray in a beautiful old tea cup and saucer along with the cutest little heart shaped cookie! Rebecca had the mimosa by the way ; ) The shop had bright pink walls - or Melon Mambo as I saw it! There were beautiful gowns hanging on racks around us and beautiful vintage jewelery and purses laying on a glass top table. 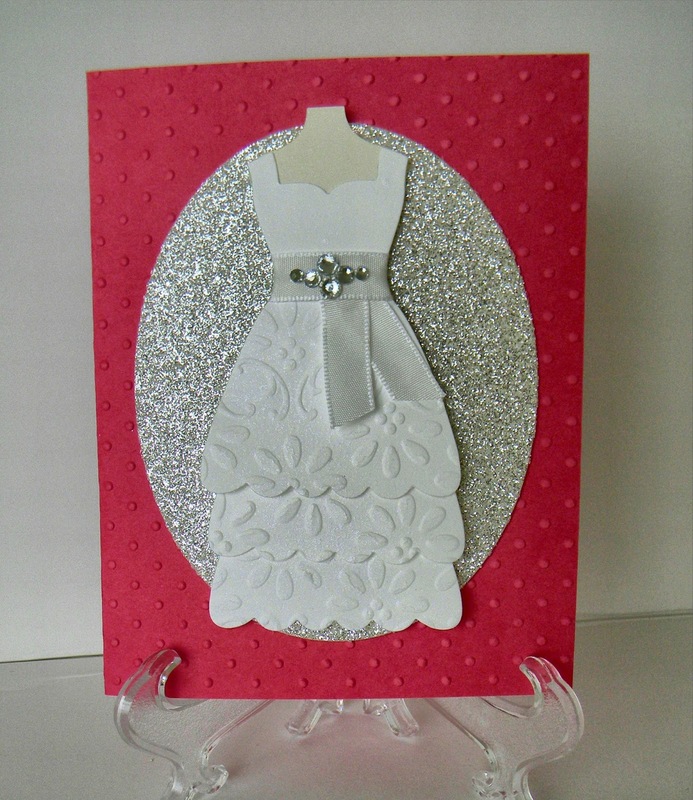 To make a long story short, Rebecca did not find her gown there but I wanted to make a card and send it to Jennifer, the women who helped us as well as Janell the owner because they were so hospitable to us. This is what I came up with. The card base had to be Melon Mambo of course because of the color on the walls. 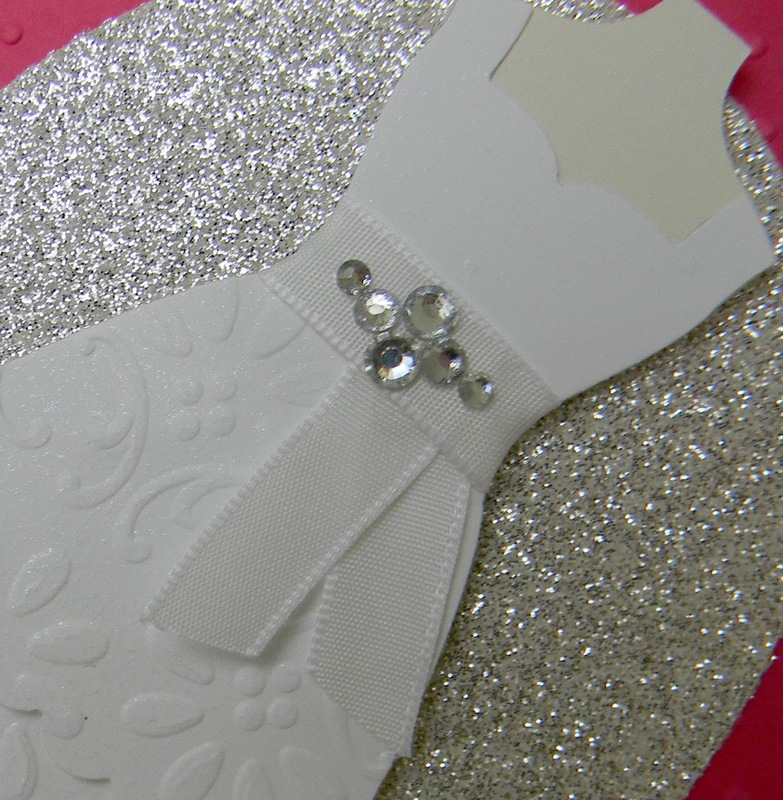 I wanted to add shimmer and chose the silver shimmer paper for that. After cutting it with the Oval Framelit, it reminded me of a mirror, which of course the bride to be looks into to check out the gown. I used the All Dressed Up Framelits Die - which I LOVE, LOVE, LOVE! I cut one full dress and then two of just the skirt so that I could layer them all together and used an embossing folder to give texture to the dress. Did you know that they have these beautiful belts that are worn as an accessory to the gown? They can either be simple satin belts that are the color of the Bridesmaids dresses, or accented with beautiful rhinestones, or gorgeous flowers. Even the bridesmaids wear them with their dresses. That was all new to me! We never had such things 27 years ago : ) I chose a rhinestone belt for this gown. I'm really excited to send this to POSH and would love to be there when they open the card and see the gown on the front! I guess I'll just have to imagine their reaction.